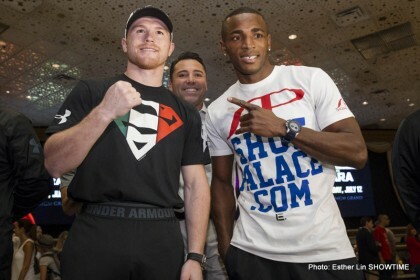 (Photo credit: Esther Lin/Showtime) WBA junior middleweight champion Erislandy Lara (19-1-2, 12 KO’s) says he’s not looking past Saul “Canelo” Alvarez (43-1-1, 31 KOs) for their pay-per-view fight this Saturday night on Showtime, but Lara is very clear about who he’s going to be going after this fight. Lara wants WBA/WBC junior middleweight champion Floyd Mayweather Jr, and he plans on being at his press conference in September for his next title defense against Marcos Maidana on September 13th. Lara expects to take care of business against Canelo, who he sees as slow of hand and foot. Lara says he’s going to beat the heavily hyped fighter and expose him in this fight. Lara might have problems getting Mayweather to agree to a fight against him because it’s not a fight that Mayweather will likely agree to, especially if Lara whips Canelo and makes him look bad. It’s not that Mayweather would be afraid of Lara. He wouldn’t be afraid, but rather he’d likely be seen as someone who is more trouble than he’s worth. This would be a big blow to Canelo’s career and to Golden Boy Promotions if Lara beats Canelo, because he’s someone that Golden Boy needs in order to make him their next pay-per-view attraction. Canelo just started having his fights sell on PPV where he’s the A-side, and he still hasn’t laid the golden eggs for Golden Boy in terms of bringing in huge numbers of PPV buys. His fight against Alfredo Angulo brought in just 350,000 buys on Showtime. Canelo and Golden Boy president Oscar De La Hoya say that he took Lara because he wants to fight the best. The only question about that is why it took this long for Canelo face Lara. Canelo was fighting guys like Matthew Hatton, Alfonso Gomez and Josesito Lopez, who weren’t considered to be the best at 154. Those guys aren’t even junior middleweights. Mayweather-Lara would be a great fight, and it would definitely be one where Mayweather would have to show more wrinkles in his game for him to win, because he couldn’t sit back with his shoulder roll and dominate a guy like Lara.